I'm off to Paris in a few weeks for a long weekend, thanks to getting overexcited when the Eurostar sale was on at the end of last year... and promptly booking tickets in March, even though the sale was only valid until February. They were still an awesome deal though, and we've just secured a cute airbnb apartment that I'm really excited about. I found it really useful to do a trip planning post when I went to Florence - as much as I hope that it helped you guys if you're looking to go, I found myself referring back to it loads when I was in Italy. And as so many of my favourite bloggers seem to spend their weekends in Paris, I'm stealing lots of inspiration from them for when I go. It's absolutely comfort food season right now. All I want to do is hibernate under my duvet and eat stodgy, greasy food - preferably bought to me by someone else. But actually, cooking is a really nice thing to do on a cold day. It doesn't involve going outside, and slaving over a hot oven is pretty pleasurable when you're chilled to the bone. By the time you sit down to eat, you're toasty and satisfied - and you have a good, home cooked meal awaiting you. Today's recipe isn't a difficult one, nor is it particularly calorific - but it does tick my stodgy comfort food boxes, as it's basically just potatoes and cheese. It's adapted from a recipe I found in the book Pie! by Genevieve Taylor, which I got as part of a set along with Stew! and Mince! Despite the 'states-the-obvious' names, they're actually really good cookbooks, full of recipes that make me go 'Ooooh, I want to make that!' which is generally what I want to get out of a recipe book. The recipes I've made lately seem to involve using up awesome ingredients - the kind of ingredients so awesome that it seems baffling you'd need to find a way to use them up. This one involves leftover salted caramel sauce. I KNOW. I made two versions for caramel truffles over Christmas, and this - my tried and tested recipe - is not thick enough for truffles (use this one). I tried to roll frozen sauce into little balls to dip into chocolate, and it wouldn't hold together for more than a few seconds. So into the freezer it went. And, what with moving soon, we're trying to use things up, so here we are. I found this recipe, and I was super excited about it, but then I decided that I couldn't be bothered with all that palaver. So instead, I cobbled something together based on that age old scientific principle of combining nice things to make one extra nice thing. It totally worked. You may have seen some bloggers recently posting beautiful illustrations of their Simply Be Real moments, (those moments that show life doesn't go as planned) in collaboration with SimplyBe. Well, I'm joining in - I was recently approached by SimplyBe to share one of my typical moments as a blogger, to be immortalised in an illustration. As a fashion blogger, there were so many silly moments that made me look like a complete weirdo to non-bloggers. Things like rushing outside in the snow to get a picture of my outfit before I got dark, always trying to wear an outfit I hadn't blogged about so I could feature it, receiving an embarrassing amount of shoes sent to work... the list is pretty endless. But now I blog more about food, I feel like I am less weird. It is kind of nice going out and not worrying so much about what I wear (although there's also part of me that MISSES caring so much), but instead, now I just can't eat something without whipping out my camera or iPhone. And that's definitely my SimplyBeReal moment - but more often than not, it's Matt that suffers. He'll be dying to eat something, and I won't let him until I've taken the perfect photo. I do this to him all the time - I think it's because if I'm dishing up, I'll take the messy plate and give him the neat one... but of course, that's the most photogenic one. I would say 'Poor Matt' but he gets awesome food cooked for him all the time, so I don't feel too sorry for him. Anyway, onto the point of this post - my illustration! I love it - Michael Jefferson perfectly captured those moments (although you can't see Matt's hangry face) and is so good - I thought it was a photograph when I first saw it. Thank you so much, SimplyBe! 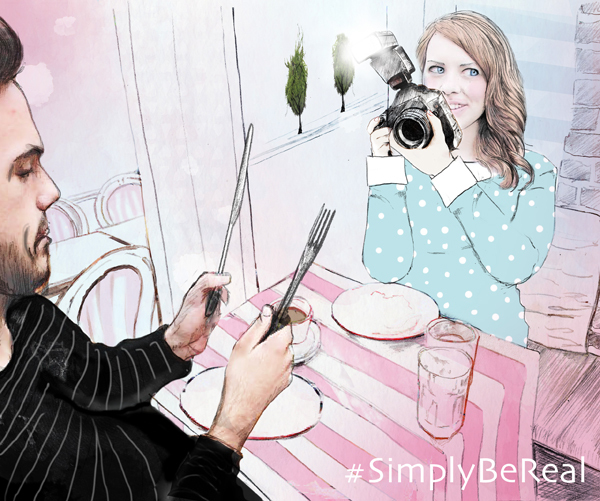 You can check out other women's real moments by visiting the #SimplyBeReal hashtag, and share your own too.